You must own your home. Why? Dogs who live with people who rent have a much higher chance of being re-homed due to rental restrictions on pets. We do not sell to those who live in cities and/or apartments. Why? We find Aussies do not thrive fully when living in cities/apartments even in homes of diligent owners. We do not sell to families who have children under the age of five. Why? Aussies are sensitive dogs. They will love their own children but may find the energy of your children's friends stressful. We reserve the right to refuse to sell our dogs to anyone for any reason we find valid. Why? We love our puppies like family! 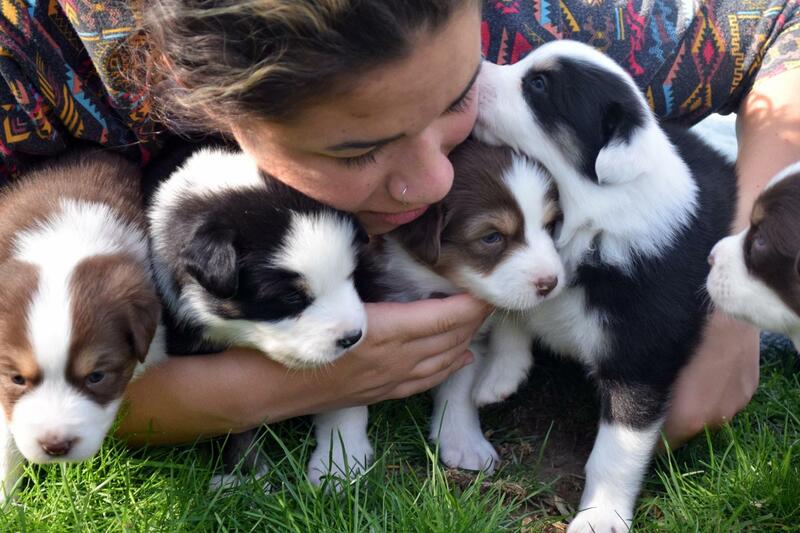 Our Aussies are ready to go to new homes at 8 weeks of age and come with all age-appropriate worming & vaccinations as well as AKC registration paperwork. All Highland Haven dogs are sold with a standard spay/neuter contract and health guarantee. We encourage puppy visits after three weeks of age by appointment. We like our new owners to get to know their puppy and we love to get to know our new owners. We are always available for any questions that arise after you take your puppy home. Most worries or concerns can be resolved with a quick phone call of reassurance. Still interested? Feel free to reach out to us via email.